Midmark Asset Tracking + Management offers more than typical equipment tracking. Through utilization reporting and par-level replenishment, Versus helps you optimize your inventory. VisibilityTM Asset Tracking is an ideal entry-level locating platform for hospitals and healthcare. Midmark Asset Tracking + Management offers more than typical equipment tracking. 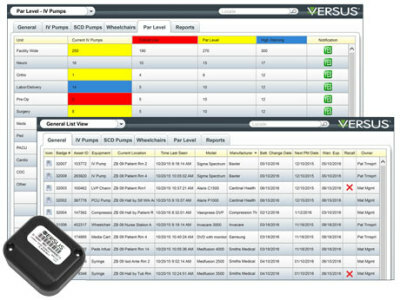 Through utilization reporting and par-level replenishment, Versus helps you optimize your inventory. An average hospital can lose $4,000 per day in lost wages due to time spent searching for mobile medical equipment, not to mention the over-procurement of assets to ensure availability. Realize quick ROI with RTLS asset tracking. List Views, and Par-Level Views (optional) combine real-time location information with important maintenance and inventory data, allowing your staff to efficiently and effectively manage your healthcare assets.